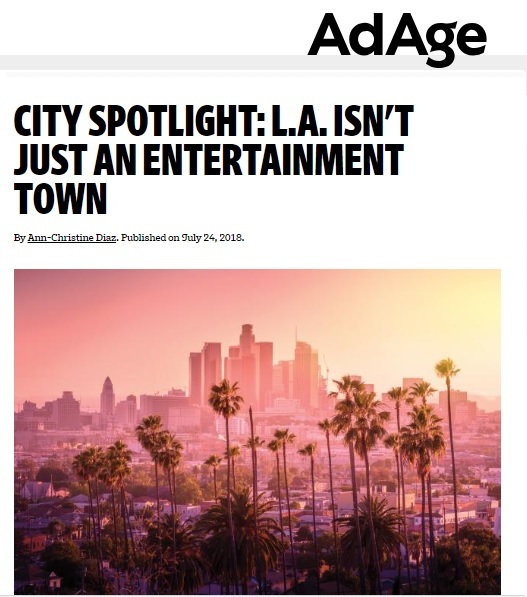 LA’s unrivaled creative economy is profiled in the leading national magazine for advertising and branding, Ad Age. LAEDC’s Chris Rico is quoted and the Otis Report on the Creative Economy is cited, research performed by LAEDC’s Institute for Applied Technology. We encourage you to read the story at this link on the Ad Age website. Thanks to Ad-Age and reporter Ann-Christine Diaz. If you are not able to access the link, we have provided excerpts of the article below. By Ann-Christine Diaz. Published on July 24, 2018 . Los Angeles has long been defined by its Hollywood legacy, an identity captured in the star-struck eyes of Mia Dolan (Emma Stone) in “La La Land.” But a campaign started last year, “L.A. Original” from agency 72andSunny, paints a wider portrait. Created to promote the city’s creative economy, it depicts L.A. as a mecca for makers in the arts, communications, entertainment, manufacturing, music and more. It features architect Frank Gehry, musicians Kendrick Lamar and Anna Bulbrook, chef Roy Choi and artists Tristan Eaton and Shepard Fairey, whose creative contributions are all deeply woven into the city’s makeup. It’s this diverse creative backdrop—not to mention the pleasant weather and loads of inspiration offered by L.A.’s diverse population—that has made it an increasingly alluring destination for creative professionals in advertising. One of the city’s unique draws is the possibility that any of its creative industries may collide at any moment–an opportunity for talents to expand their portfolios and experiences. That’s reflected in 72andSunny’s other major city initiatives, including L.A.’s bid for the 2024 Olympics (won by Paris) or its collaboration with Gehry to remake the Los Angeles River as a green space and community hub. Last year, French agency BETC opened in L.A. with an online workout program created with L.A. Dance Project and its founder, celebrity choreographer Benjamin Millepied. And a chat with the various creatives in town might likely reveal that yes, they too, are working on a potential Netflix deal. BBH’s Swedish-born Global Chief Creative Officer Pelle Sjoenell, who’s based in the agency’s L.A. office, set his sights set on the city more than two decades ago. Raised on a healthy Hollywood media diet, his then-girlfriend (now wife) had family roots in L.A., which meant taking yearly trips into town. It was then that the fell in love with L.A.’s culture of creativity and storytelling. Even afterdetours in Minneapolis at Fallon and BBH in New York, he knew he’d ultimately end up there. Agencies, meanwhile, have branched out to embrace the culture of production, giving birth to separate facilities dedicated to executing content in and out of advertising. Sprung from Deutsch was the 48,000-square-foot production facility Steelhead, while 72andSunny’s in-house facility Hecho en 72 recently rebranded to become Hecho Studios, a standalone production facility under the MDC umbrella, run by former 72 execs Tom Dunlap, managing director, and Gui Borchert who serves as executive creative director. TBWA/Chiat/Day L.A. and TBWA/Media Arts Lab could be seen as the original advertising “pirates” of Los Angeles. When TBWA’s venerable leader Lee Clow spoke during Ad Age’s recent Small Agency Conference, he recounted that in his early days at Chiat/Day, the agency’s founders Jay Chiat and Guy Day, sought to bring the revolutionary creative mindset thriving on the east coast at agencies like DDB in New York, to the opposite coast in Los Angeles, which hadn’t been seen as an ad town. “Jay and Guy saw the energy of what was going on in New York,” he said.” They wanted to be part of that, desperately.” The agency, with its work for Apple and more has gone on, in spades, to realize that goal. Along with 72andSunny and Deutsch, TBWA is one of the advertising anchors of the Playa Vista neighborhood. But that’s just one hotspot on the Westside, now also known as Silicon Beach with the arrival of big tech players like Google, Snap Inc.,YouTube, Facebook, Yahoo and others. It’s a creative congregation that has come to rival the Beach’s namesake up north. 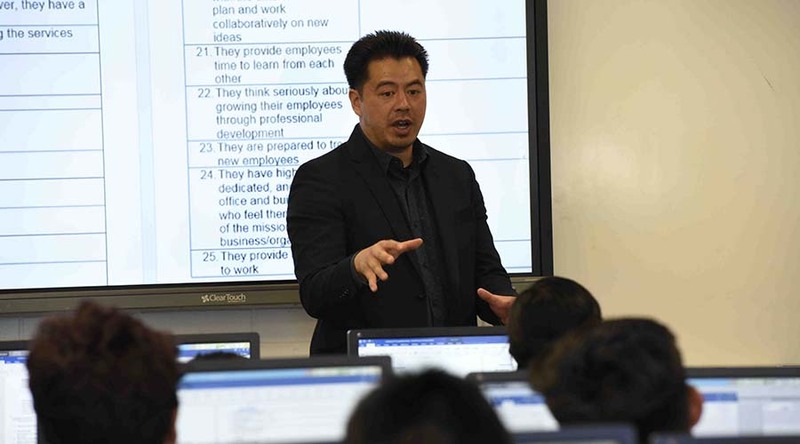 Chris Rico is an entertainment industry vet who now serves as director of innovation and director of Entertainment and Digital Media Industry Cluster of Development at the Los Angeles County Economic Development Corporation. After working in the Bay Area for a few years, he returned to L.A. in 2014 for his current post. “I came back because of the diversity of ideas,” he says. “L.A. used to be a one-conversation town and it was all about Hollywood.” But the tables have turned. The talk up north is all about one thing (apps), but in L.A. it spans fashion, food, art, civic and social innovation and technology. Entertainment of course is still robust, yet its face is changing, with digital giants looming large over Hollywood. Apple and Amazon are shoring up their content game in new L.A. spaces securing massive headquarters blocks apart in Culver City–with Apple reportedly taking over a space HBO had been eyeing and Amazon moving into a 280,000 square foot space rife with Hollywood history, Culver Studios, where iconic films including “Gone With the Wind,” “Rocky,” and “E.T. the Extra Terrestrial” were shot. Netflix, too, has cemented its presence: Last year, it moved from Beverly Hills into its new headquarters, the boxy Icon Building on the Sunset Strip. It now seems to be further marking its territory with its recent reported bid to partially acquire billboard company Regency Media for $150 million. According to Reuters, if finalized, the sale will give Netflix nearly three dozen outdoor displays on Sunset. “There is a moment in time when digital media will supplant traditional media, and that moment may be now,” Rico says. Notably, Netflix recently ended HBO’s 18-year-run as the most Emmy-nominated media company, earning 112 nods over the cable network’s 108. All told, according to the 2018 Otis Report on the Creative Economy of the Los Angeles region and California, the total creative economy output from Los Angeles region last year was $198 billion, compared to $407.1 billion from California overall. From 2011 to 2016, jobs in communication arts saw 12.5 percent growth from 22,000 at the beginning of that period to 25,200, while digital media saw a 48 percent jump in that time, from 10,000 to 14,800. In terms of quality of life, there’s the pleasant weather of course, and there’s plenty going on in art, food and entertainment to provide inspiration, infused with endless influences of L.A.’s diverse ethnic population–whether it’s African-Americans, Latinos (Mexicans being the largest group), Middle Easterns and Asians including Korean, Thai and Filipino communities.